Today Caltrans sent out a request for revised RSP Questionnaires so that they know what tests your laboratory is certified for. If you did not get an email you should contact the Reference Sample Program at caltrans_reference_sample_program@dot.ca.gov. 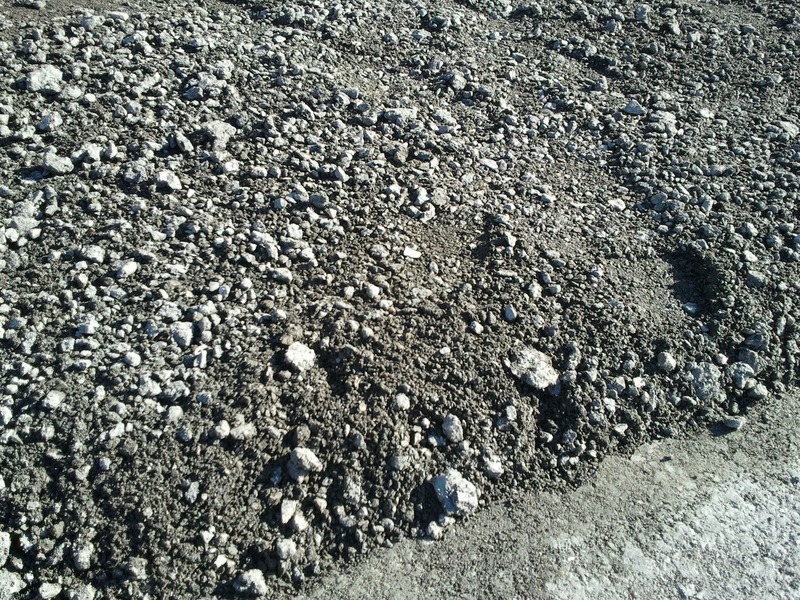 Their email also let us know that they plan on sending out RSP samples in May and October of 2012. 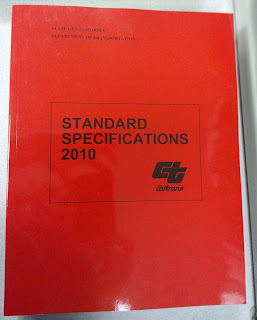 We just got our paper copies of the Caltrans Standard Specifications and boy are they big! They're $30 off of the Caltrans website here. Happy Reading! 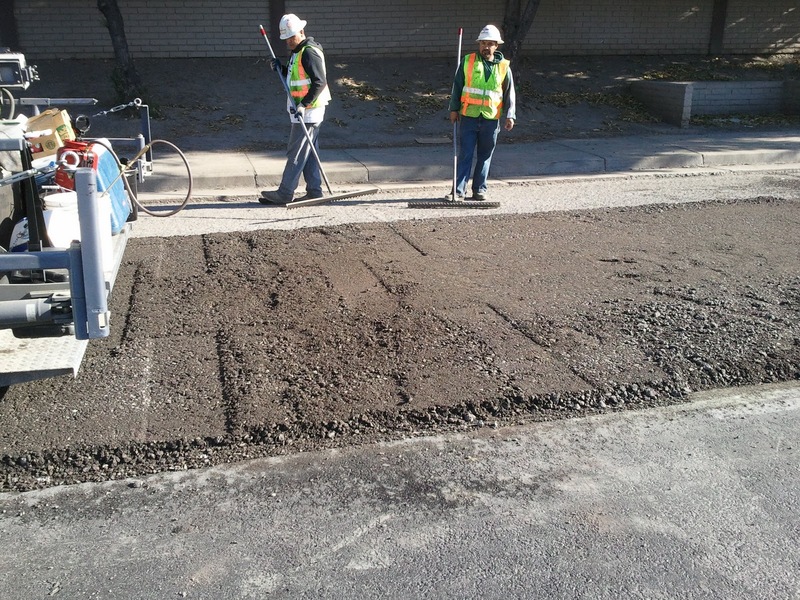 If you've ever worked with Caltrans on a construction project, either as a contractor or supplier you've no doubt had at least one experience where you have had poor turn around time on the QA test results from Caltrans. 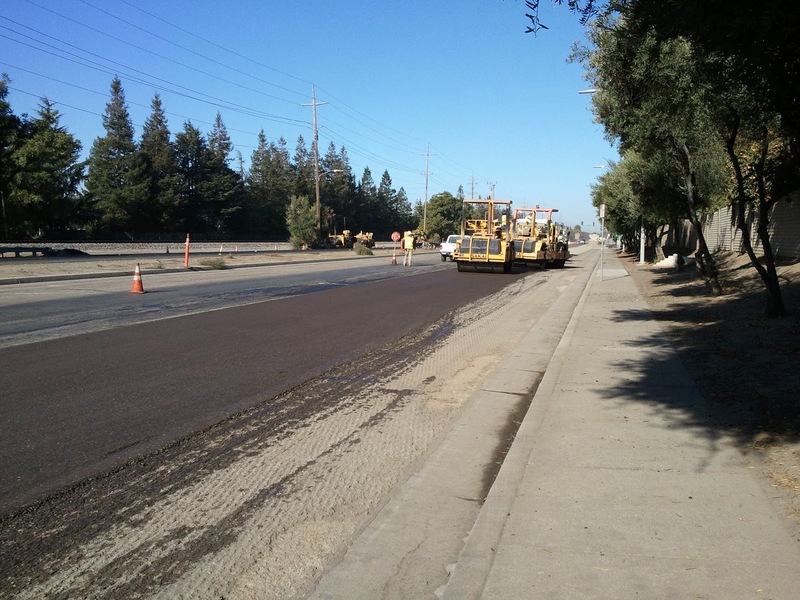 Although this is not always the case, Caltrans has set a reputation for itself of returning test results to the contractor weeks or months after the date of paving. In some cases, contractors don't receive the test results until well after the job has been completed, if at all. Many industry associations and businesses have addressed this issue with Caltrans at various levels and it looks like this time CALCIMA is taking a stab at it. In a letter to Malcolm Dougherty, Acting Director of Caltrans, CALCIMA points out the issue, explains why it is detrimental to contractors, and offers several realistic solutions. The letter in its entirety can be found here. Many of the solutions offered in the letter are actually things that Caltrans is currently looking into and moving towards in the future. Among these are having all Caltrans labs accredited by AASHTO and having an independent 3rd party certify Caltrans and Industry laboratories. As I have mentioned before, I also believe that these steps will do a world of good for the Industry and Caltrans alike. 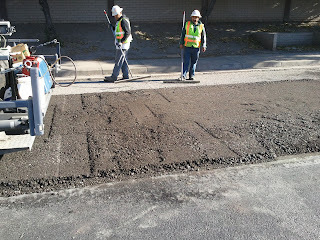 Another solution that is offered to Caltrans is having an independent laboratory perform the QA testing. This has been suggested by many people over the years and it is still a bit murky as to why this is not a feasible solution to Caltrans. 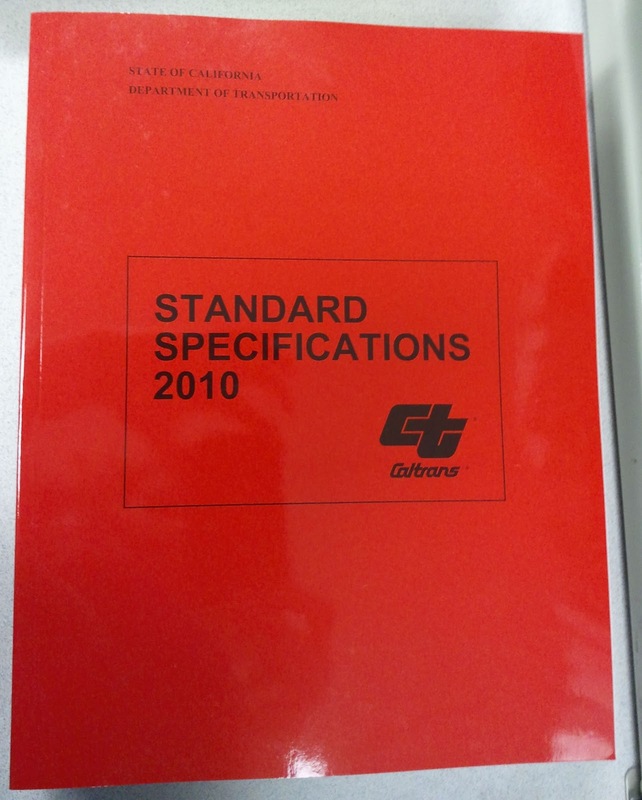 In 2010 the District 4 Caltrans lab completed over 160 mix designs and verifications. 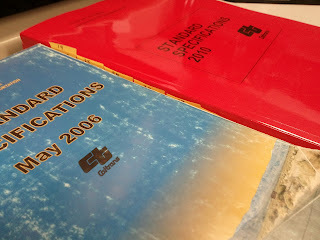 For those of you who have not been directly involved with a mix designing process let me tell you that if everything goes right on the first try (which it often does not), you are looking at 4-5 full days of testing for one person which means that in 2010 District 4 dedicated over 6400 man hours to mix designs and verifications. Now take a step back and realize that these are JUST mix designs and verifications. This doesn't include transferring the samples to the lab, field inspections, plant inspections, daily QC/QA testing, or the hundreds of other various tests that their lab performs throughout the year. 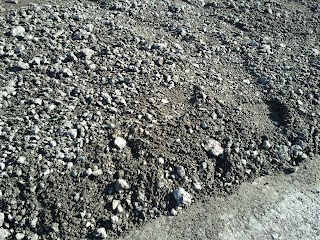 When you really look at it, there's no wonder why Caltrans has issues with making a 48 hour turnaround deadline. Especially when you factor in the state budget cuts and furloughs. I personally do not blame the Caltrans laboratory for not being able to make the specified turnaround because I know how impossible that quantity of testing can be for a lab. What I am confused about is why Caltrans has not agreed to sub out some of their work to obtain the turnaround time that they've put in their own specifications. Caltrans has made a huge push over the last year towards partnering with contractors so that an issue can be resolved at the time of construction instead of after the fact in dispute resolution. Subbing out some of their lab work to 3rd party laboratories would undeniably help with this initiative and in the larger scheme of things create some much needed jobs for the construction industry. In pursuit of this partnering Caltrans could also benefit from CALCIMA's last suggestion which is to allow 3rd party labs and contractors to come to the Caltrans labs to view how they are performing the test methods. This type of behavior seems to vary from district to district but some Caltrans labs do not allow any outsiders to view them testing. This is completely contrary to Caltrans' partnering initiative. There are probably a plethora of reasons as to why those districts refuse to allow people in their labs but the biggest reason that they should is that there are many test methods that have a lot of grey area. These test methods allow for a technician to make a decision based on his experience with the test and many of these decisions are visual. As a technician teaches another technician the test, and that technician teaches another person, the tricks and reasoning behind how and why to do the test exactly as it was done when it was created can diminish. Being able to work with the Caltrans lab and see how they are performing the test will give 3rd party laboratories an opportunity to correct any differences between how each lab runs the test and reduce disputes in the future when the test results do not match. It is easy for us to say that Caltrans doesn't know what they are doing but to be honest, I would assume that many of us make similar "mistakes" all of the time. Having a pre-job refresher with the Caltrans lab would allow both labs to correct themselves if necessary. It's nice to see the industry coming together as one unit to offer solutions to Caltrans and other owner entities. Working towards change is always a long curvy road with a ton of speed bumps but we're getting better at navigating through it all now and it is only a matter of time until the Caltrans partnering initiative really comes to fruition.